Everyone experiences pain, whether it’s emotional or physical, chronic or acute. Pain is part of what it means to be human, and so an understanding of how we relate to it as individuals – as well as cultures and societies – is fundamental to who we are. 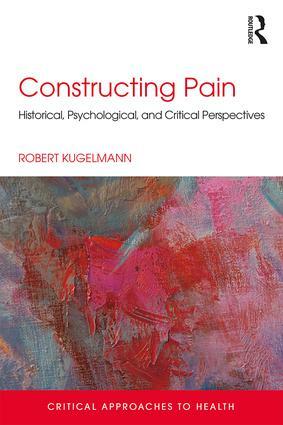 In this important new book, the first in Routledge’s new Critical Approaches to Health series, Robert Kugelmann provides an accessible and insightful overview of how the concept of pain has been understood historically, psychologically, and anthropologically. Charting changes in how, after the development of modern painkillers, pain became a problem that could be solved, the book articulates how the possibilities for living with pain have changed over the last two hundred years. Incorporating research conducted by the author himself, the book provides both a holistic conception of pain and an understanding of what it means to people experiencing it today. Including critical reflections in each chapter, Constructing Pain offers a comprehensive and enlightening treatment of an important issue to us all and will be fascinating reading for students and researchers within health psychology, healthcare, and nursing. The volume was recently reviewed as part of History of the Human Sciences‘ book reviews initiative.